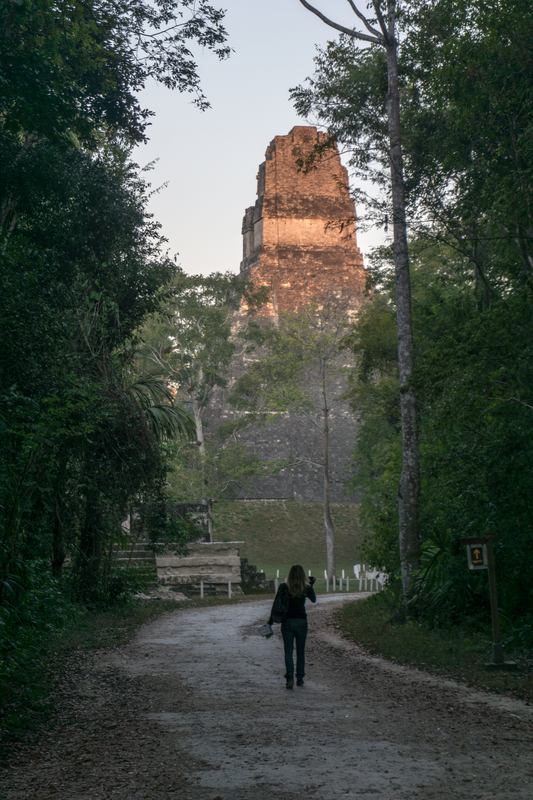 If you are going to go to a Mayan Ruin, let Tikal be the one you see. But don’t go with the rest of the tourists melting in the daylight heat. 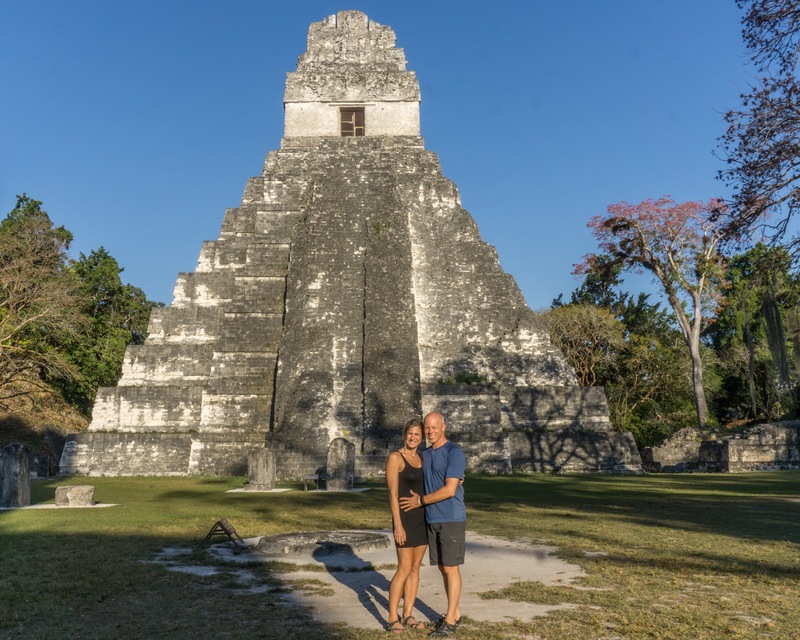 Tikal is truly a magical place, a beauty that will pull you in, force you to take a breath, to slow down, to respect and adore it’s beauty, especially if you do it right. Apparently, I have limited attention & hyperactivity that could be considered dysfunctional, so very few situations trick me into sitting still, holding my attention. Tikal tricked me and lured me into wanting to just sit and soak in the captivating view. 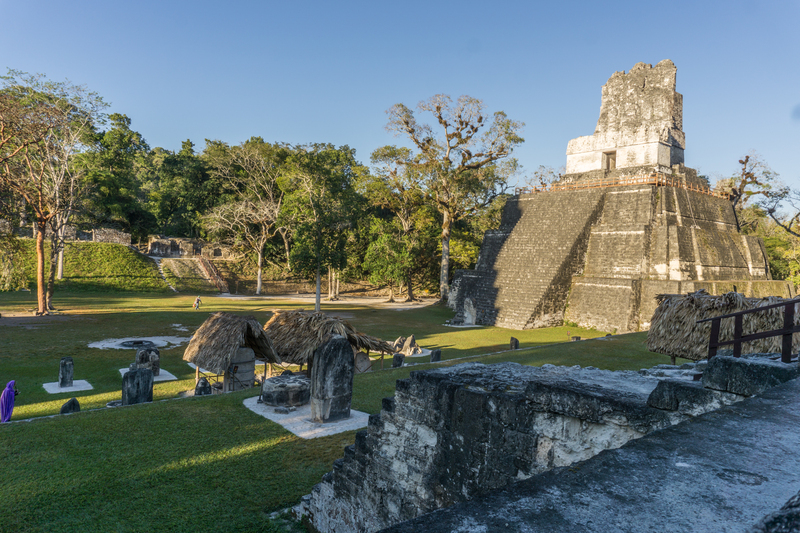 Tikal, situated in the Jungle of northern Guatemala was one of the most powerful Mayan civilizations in pre-Columbian times. Apparently Tikal was the first to use air strike attacks in battle (throwing spears rather than hand to hand combat). 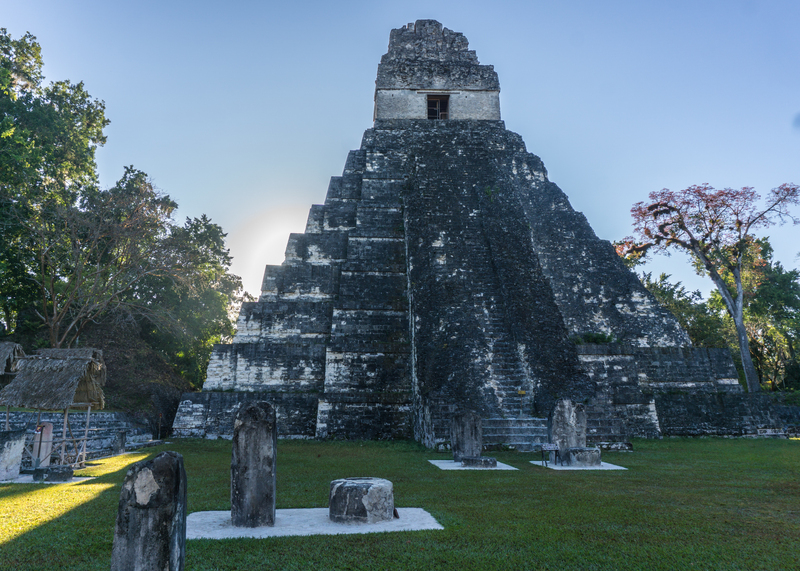 The Mayans settled in the Tikal area around 700 BC! Then, like many other Mayan civilizations it mysteriously collapsed (around the year 900). 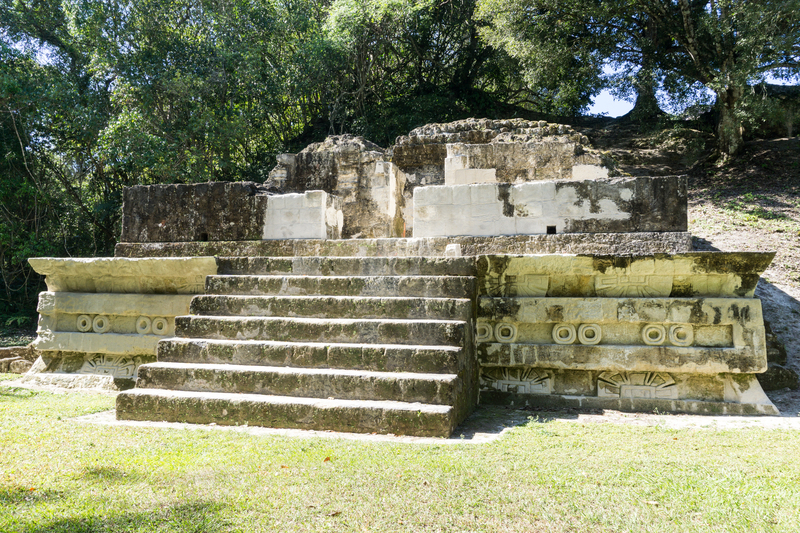 Structures are often layered, as the Mayans built on top of existing structures, some with up to 14 layers!! Many structures held tombs of dynasty rulers and Temple IV is currently the tallest archeological Mayan structure in MesoAmerica. 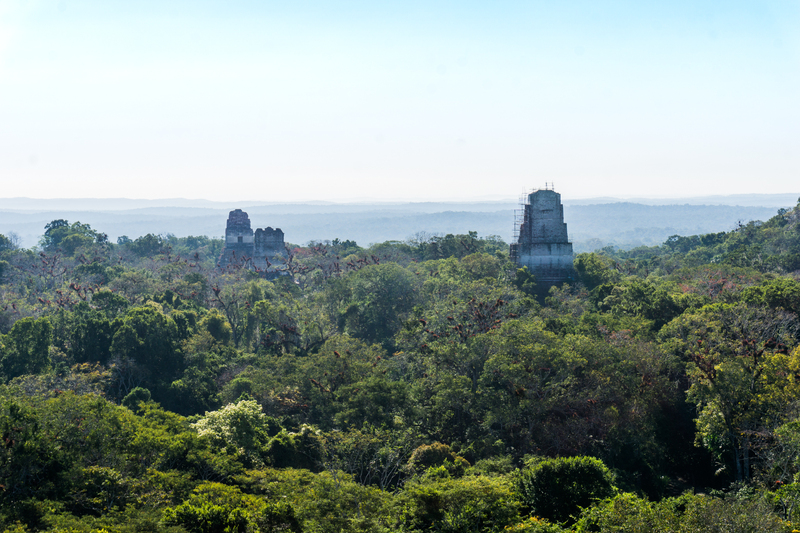 Not surprisingly Tikal was declared a Unesco World Heritage site in 1979. Star Wars fan fact: The view from Temple IV was used in Star Wars! See more here! We entered the park at 5:50a and ran to the Gran Plaza to sit face to face with Temple I & II during sunrise. 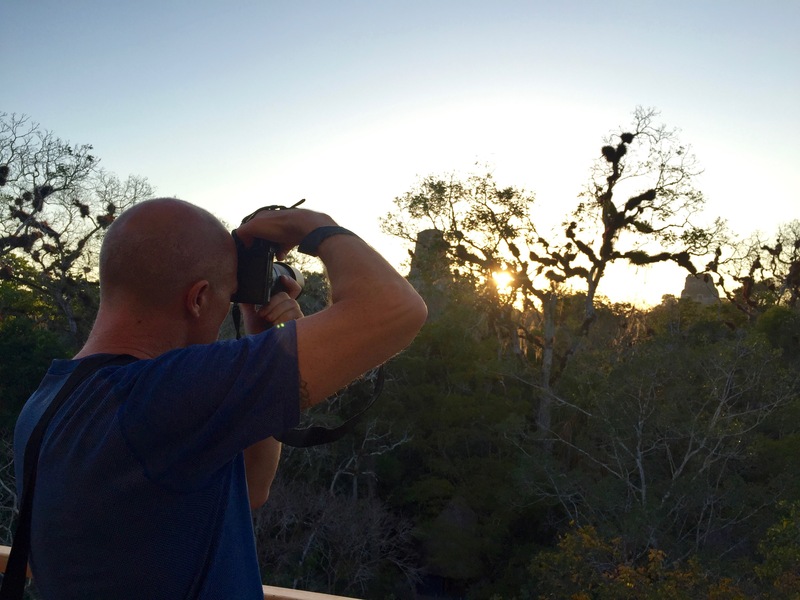 This is not what the more expensive sunrise tours do. 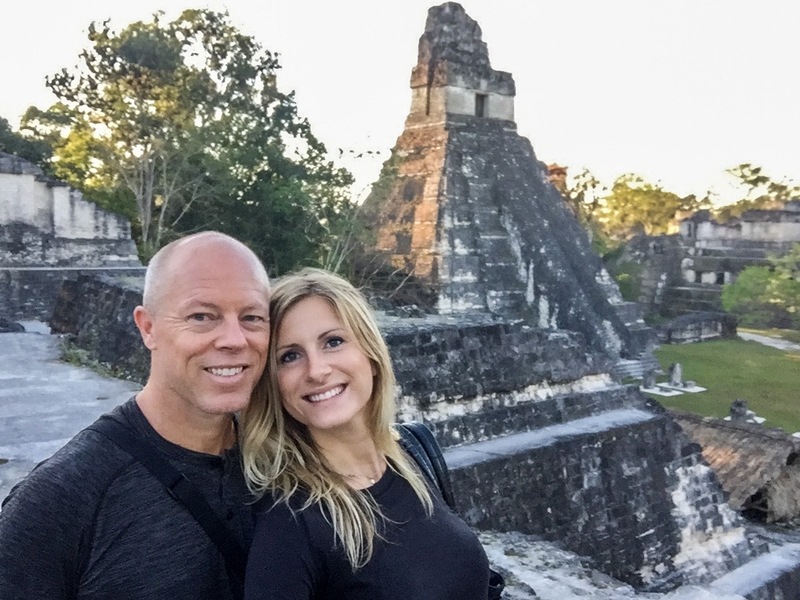 The sunrise tours commence at 4:00a and go to Temple IV for the sunrise. It makes sense; 65 meters high, Temple IV allows you to peer above the jungle tree tops with a view of Temple I & II sticking beyond the jungle tree tops. Watching the sun rise above the tree tops in the background of Temple I & II would be beautiful. 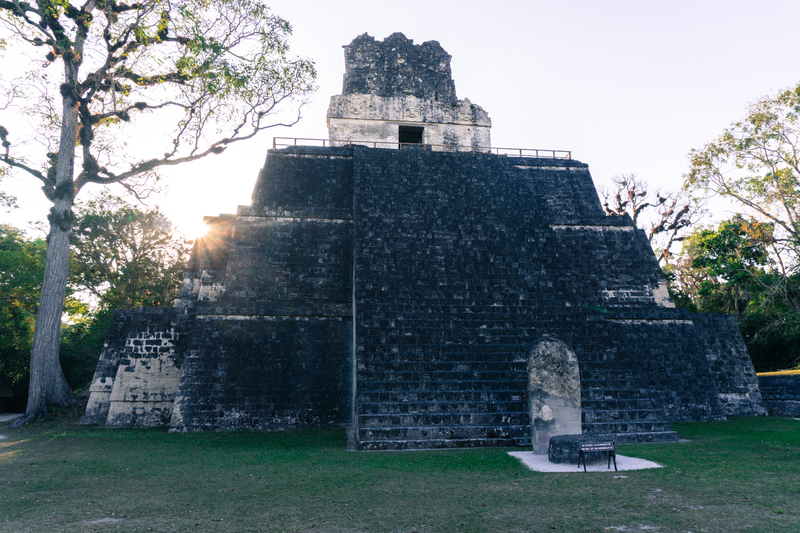 However that’s where all the tours are, and we could make out at least 30 people crammed onto the top of Temple IV, while we experienced the golden light hitting the temples, along with the waking jungle sounds completely alone. See our video for a taste, it sounded like we were in Jurassic Park! For us the magic of a place is magnified when it’s just you and that temple staring back at you. 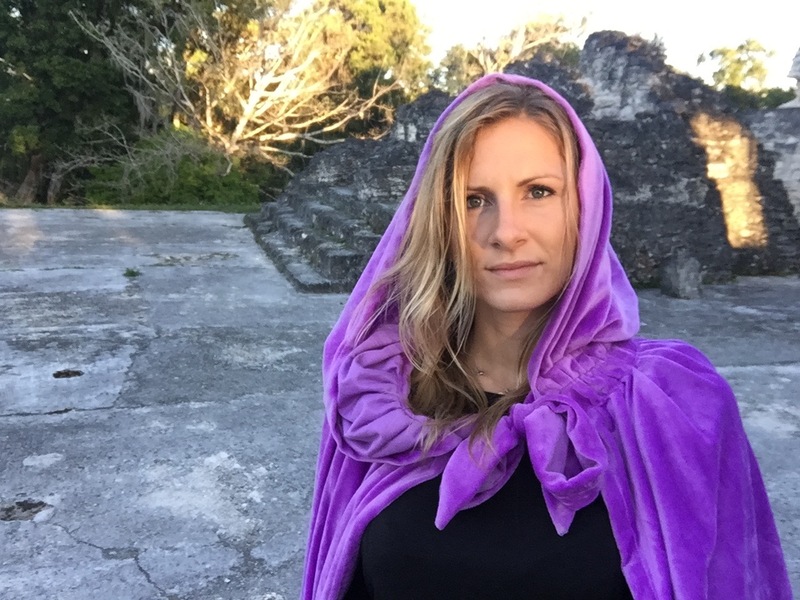 It also makes it much more fun for me to throw on my purple cape, and get lost in my own world. As an aside, the cape is a gift from awesome gift-giving friends, and we promised to take photos of it in locations that they couldn’t join us at! 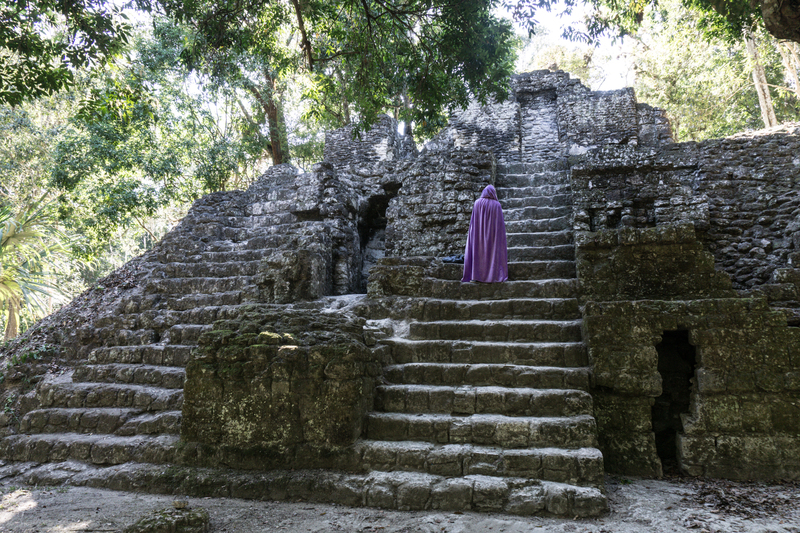 Hilariously, I got compliments from a local tour guide on the cape at Tikal, with him comparing it to that of an early explorer of Tikal! Anyway, happily alone, we sat watching the sun slowly illuminate each step of Temple IV. After sunrise we walked around watching monkeys play in the trees, caught site of a Tucan, and spied the many other archeological structures in this massive ruins. By 9:00am the tour buses started dropping off people on day trips (mostly from Flores) so we walked back to our campsite to relax in the shade while the heat & tourists intensified. Mind you to be fair, considering Tikal’s splendor the crowds are surprisingly small here (especially in comparison to Chichen Itza). We went back to the ruins around 4:30pm as the temperature cooled, to enjoy another glimpse of the Temples but with different lighting. The ruins close at 6:00pm but there are sunset tours you can do that go until 8:00p. We would have done that, but didn’t buy in time as they left at 4:30pm! As it was, we had the area nearly to ourselves. People often do a day trip from Flores (an hour and a half away). Our recommendation is, don’t do this! Instead get up to Tikal in the late afternoon, spend the night at one of the hotels/campgrounds, such as were we stayed, the Jaguar Inn. Get up early and start your day entering the gates at 5:50a! (It opens at 6a technically, but like us the guard may let you in early if you are friendly). You could do the 4:00a sunrise tour and possibly break off to be alone. Make sure to check sunrise times when you’re there so you don’t miss it. If you need to get back enjoy the morning and head back to Flores mid-day. Then it still counts as a day trip, it’s just shifted in time from the typical day trips from Flores leaving at breakfast returning at dinner. This way you’ll miss the swarms of people walking around the jungle in the sweltering heat, getting exhausted in a hour and wanting to leave for a cold beer (exaggeration for effect). If you are an overlander there is a campground that was really nice or you can camp at the Jaguar Inn across the street like we did. Both are the same price, but the Jaguar had semi-decent wifi, possible electricity hook ups which the campground doesn’t. Jaguar also has showers and a nice resturaunt. 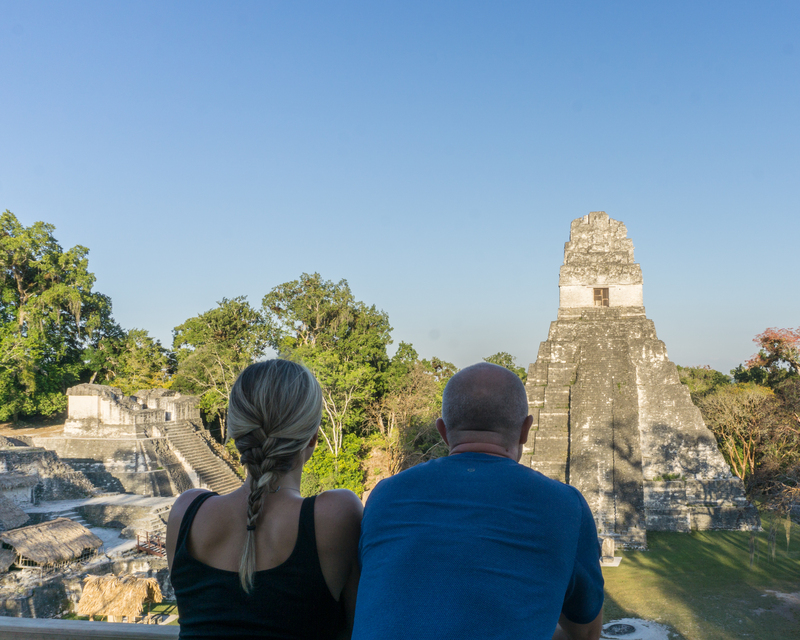 We hope you can make it to Tikal some day or have enjoyed it in the past! If so, and you have other tips, please feel free to share in the comments or send us a write up and we will feature you! 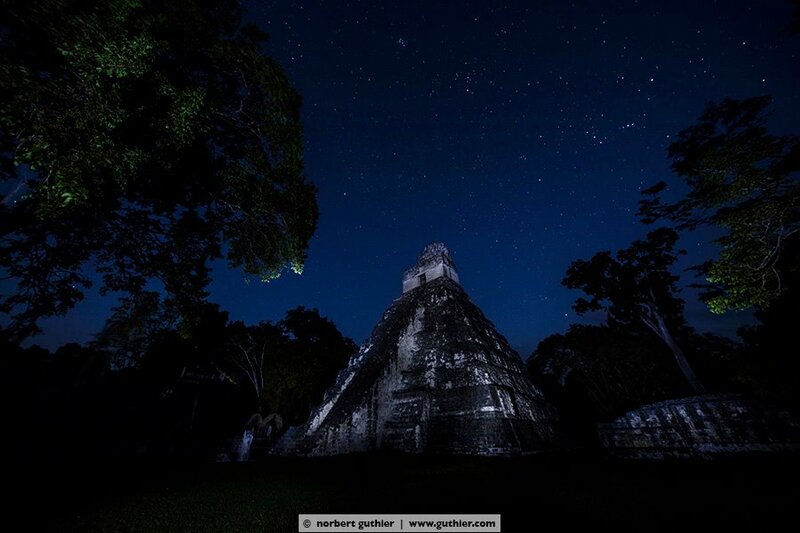 If nothing else, hopefully you can enjoy a glimpse of Tikal’s beauty here! of course, glad it could help!